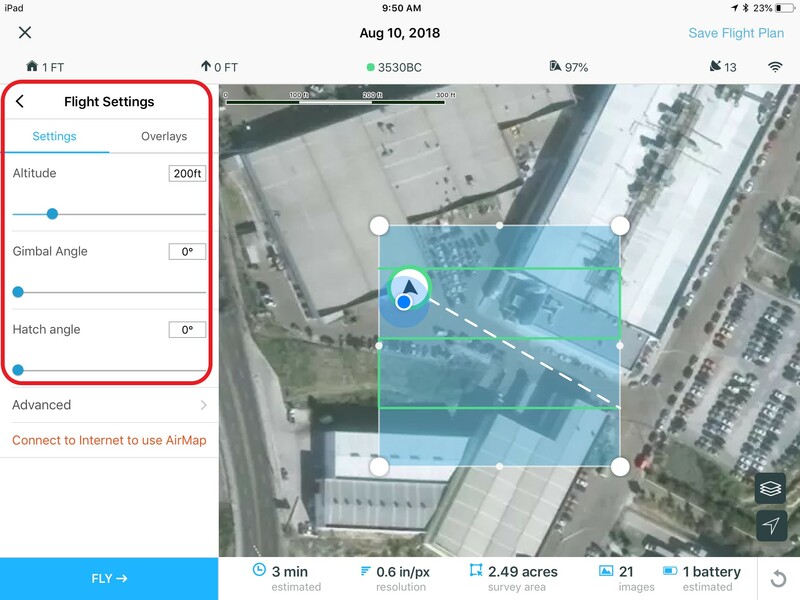 Each of the flight modes serves a specific purpose, for example, if you’re interested in capturing the differences in elevation within your site for a Point Cloud or to create a DEM, flying a "Crosshatch Survey" would be the best option. 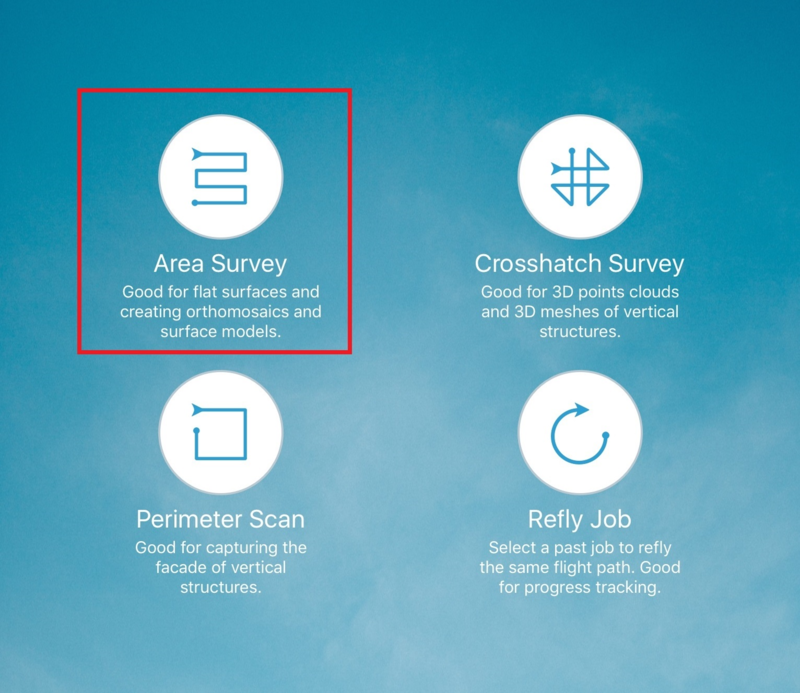 Similarly if you’re interested in a bi-dimensional representation of the site through an ortho for CAD overlaying or to measure horizontal distances, "Area Survey" would be better. 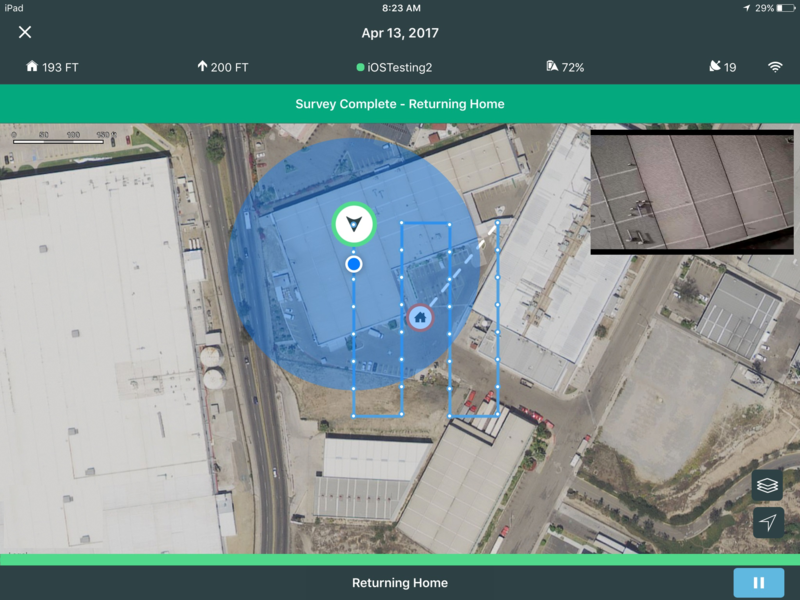 There are more use cases and advantages to each survey type, but for this example we’ll be choosing “Area Survey”. 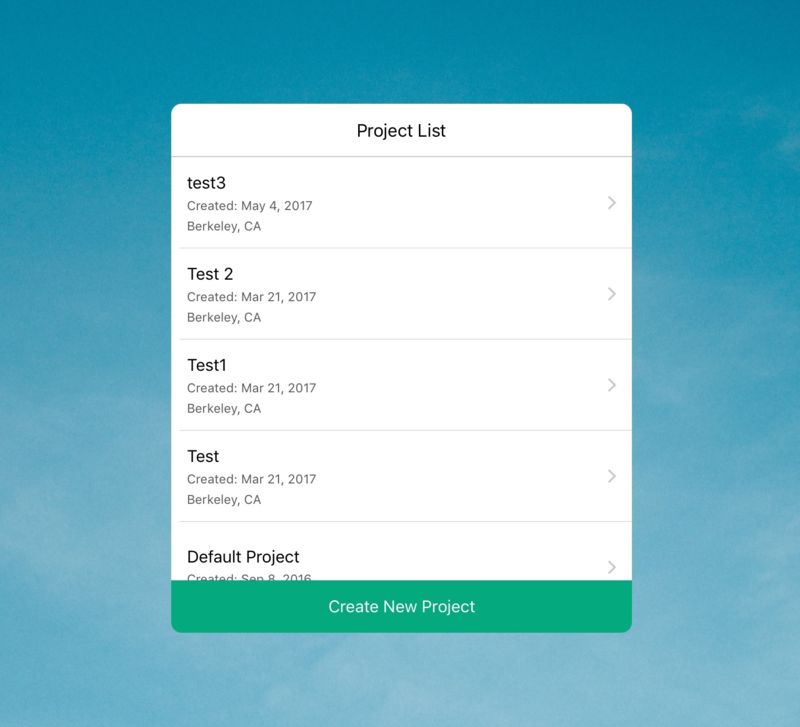 Upon opening the app, you’re given the option of selecting what Project you want this new flight to go into. You can also create a new Project by selecting the option labeled as such at the bottom of the window. After you select a Project you are then taken to the “Flight Modes” screen. 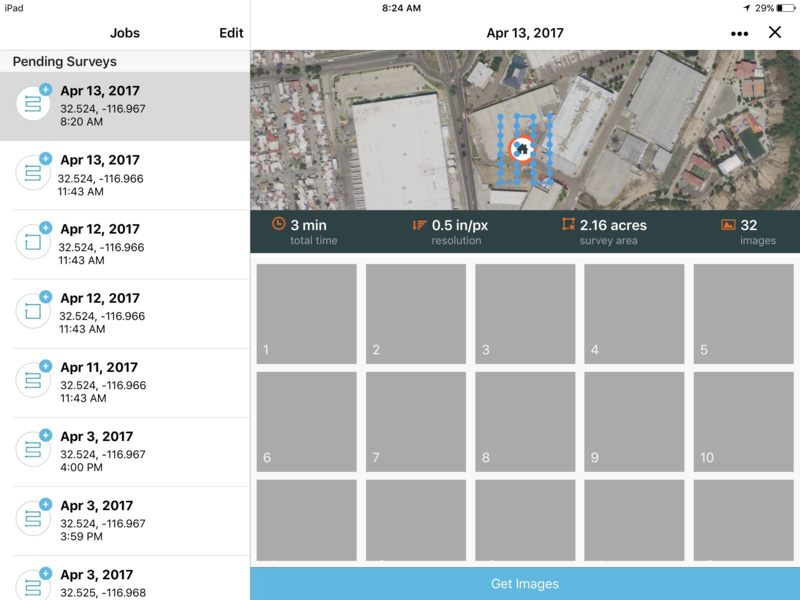 Next, select “Area Survey” and you’ll be taken to the map view screen. Here you can see the telemetry information at the top and the aircraft location on the map (when GPS connection is established). 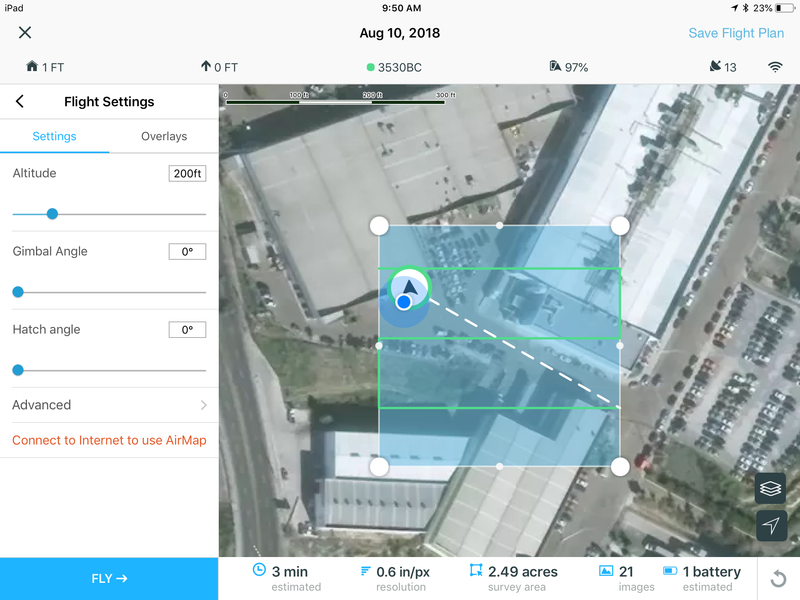 On the right of this screen you can find the Flight settings window which allow you to modify the altitude of the survey, the Gimbal angle and the Hatch angle. Moving the Gimbal angle slider will determine where the gimbal is pointing towards during the survey, be it straight down (Nadir) or straight forward (Horizon). Next, modifying the Hatch angle will allow you to choose an optimal path for the vehicle to take during the survey, it’s best to choose a hatch angle that decreases the amount of turns in the survey, please note that the Hatch angle is optimized by the application but you can modify it per your needs. 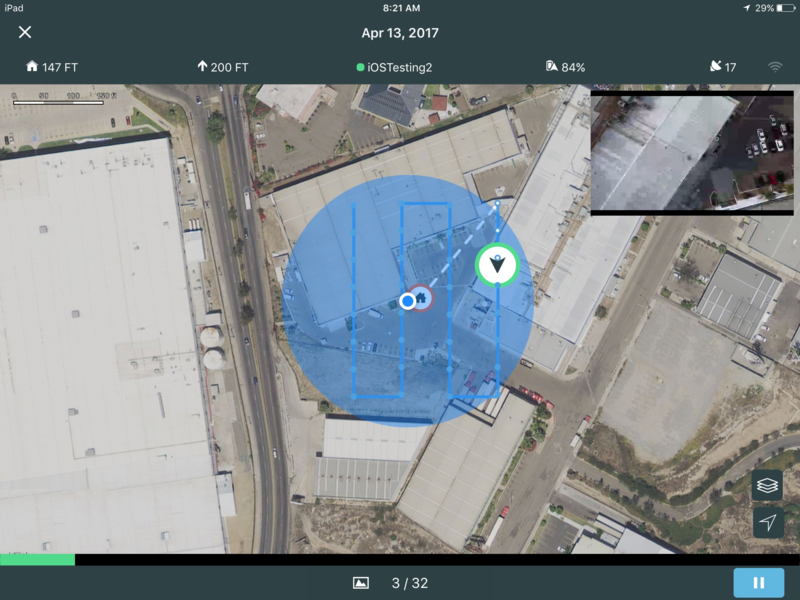 For this example, set the Survey altitude to one that clears all obstructions (while taking into account local flight regulations) and leave the Gimbal angle at 0 degrees. 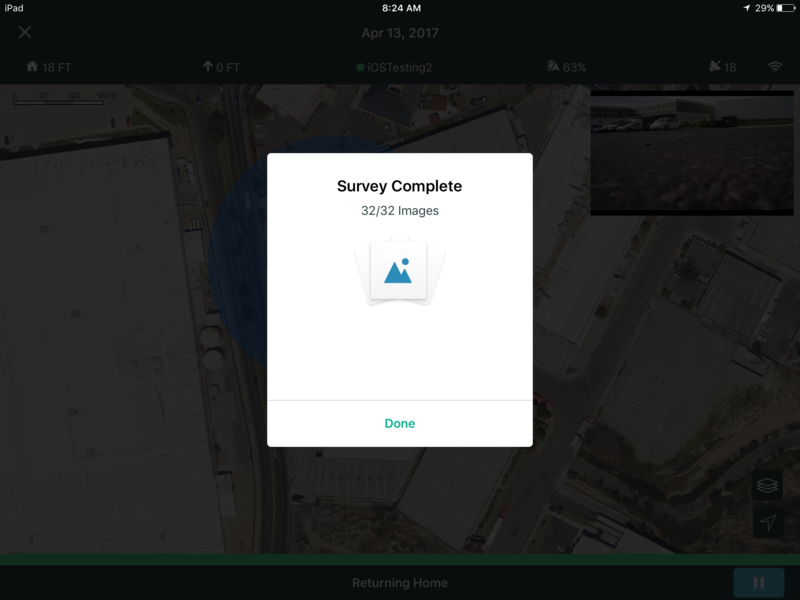 When on this screen, a box will be automatically created displaying the area of the survey. You can drag each of the 4 corners to move the vertices around and place the survey box over the area of interest. Tap and hold the corners to move the vertices around. You can create new vertices by grabbing the small circles in between each vertex. On the bottom of the screen is an undo button. 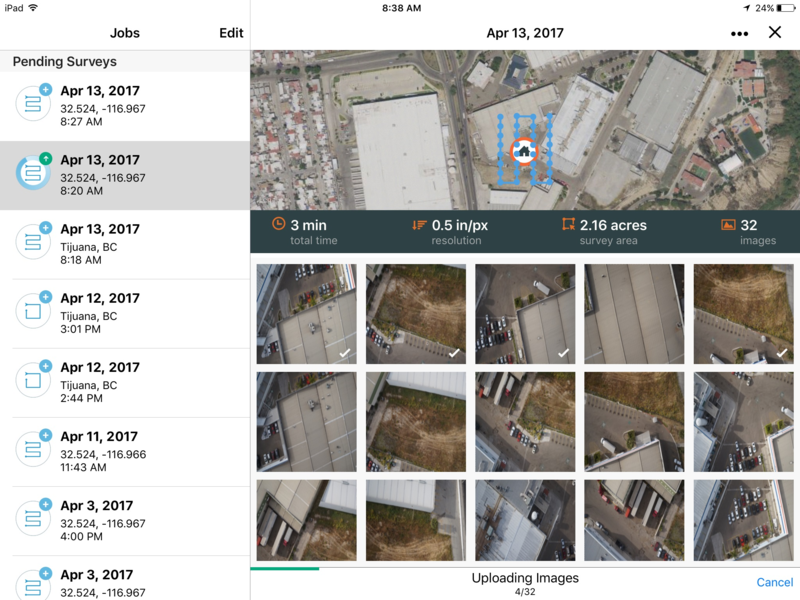 Statistics on the bottom show how long the mission is expected to take, the estimated ground sampling distance (GSD) of the photos, the acreage, and the number of photos expected to be taken. 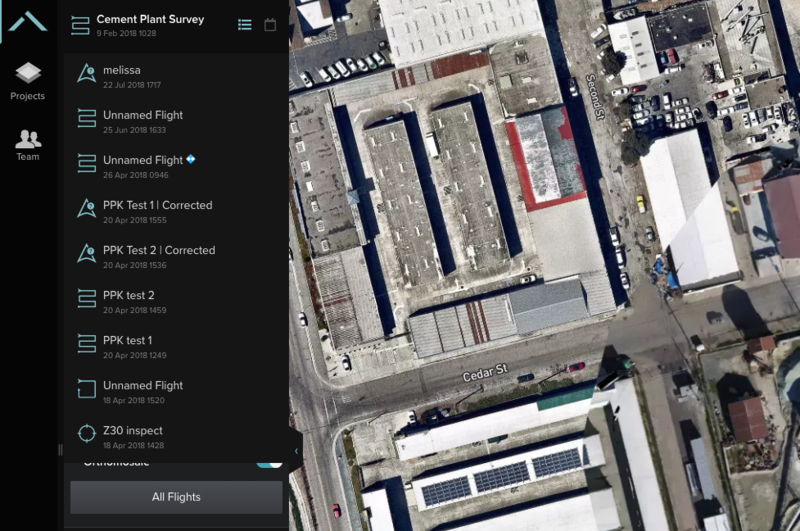 To begin flying the planned survey, hit the green “Fly Survey” on the bottom of the screen. 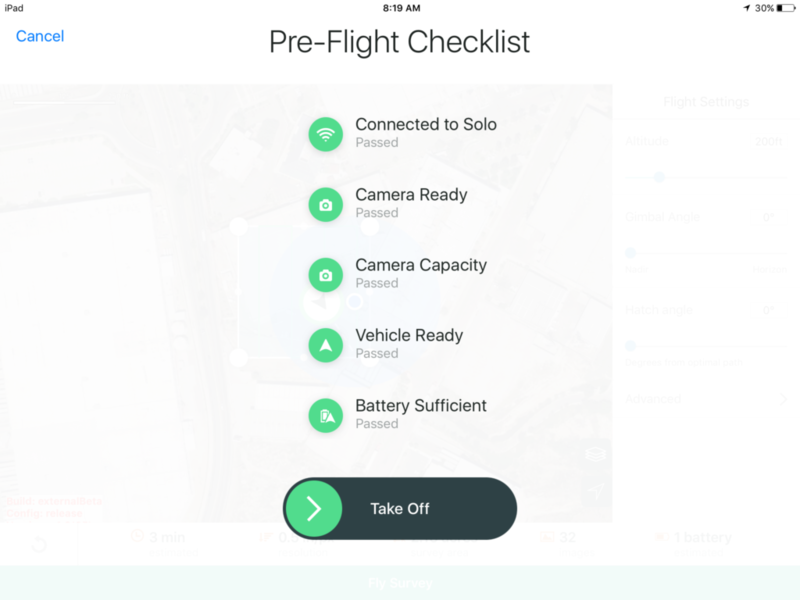 This will introduce a checklist while the system goes through and makes sure the aircraft is ready to fly. Slide the ball to the right to takeoff. Your drone will takeoff and climb to the desired altitude. The camera will point nadir once it reaches this altitude. The drone will fly the path noted on the screen. The dots will turn white after the aircraft has passed that checkpoint. 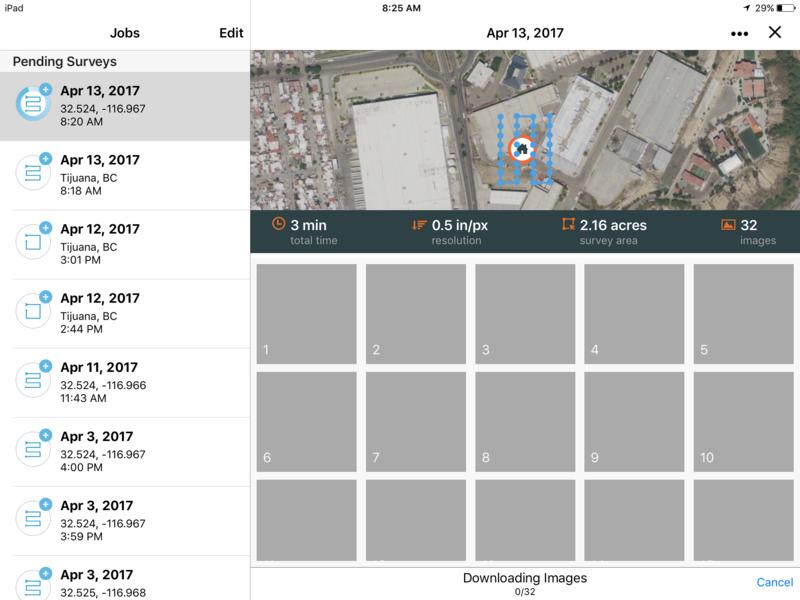 After the flight data has been retrieved, the app will display the number of photos taken and geotagged. At this point it’s best that you do not turn off the vehicle or the controller yet. After the flight is retrieved, click the “x” at the top left of the screen to go back into “Flight modes”. Here a flight notification will appear on the upper left of the screen. Clicking on this button will open the flights page. You can rename the flight by clicking on the ellipses (…) on the top right. To wirelessly retrieve the images from the camera, press the blue “Get Images” button at the bottom. After the download is complete, the button changes to an “Upload to 3DR Cloud” button. Connect to the internet to upload the images. 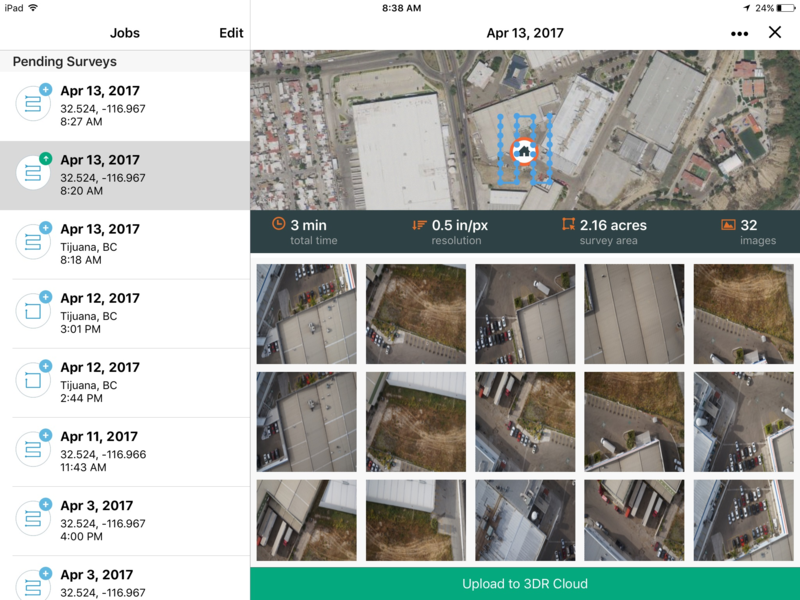 After the upload of an image to the 3DR storage cloud is complete, white check marks will appear on them. Once the progress bar at the bottom is fully loaded, the upload will be completed. After logging into Manager using your Site Scan credentials, select the Project on the left side bar that contains the flight you want to process (alternatively you can click on the "Projects" button and select it from there. 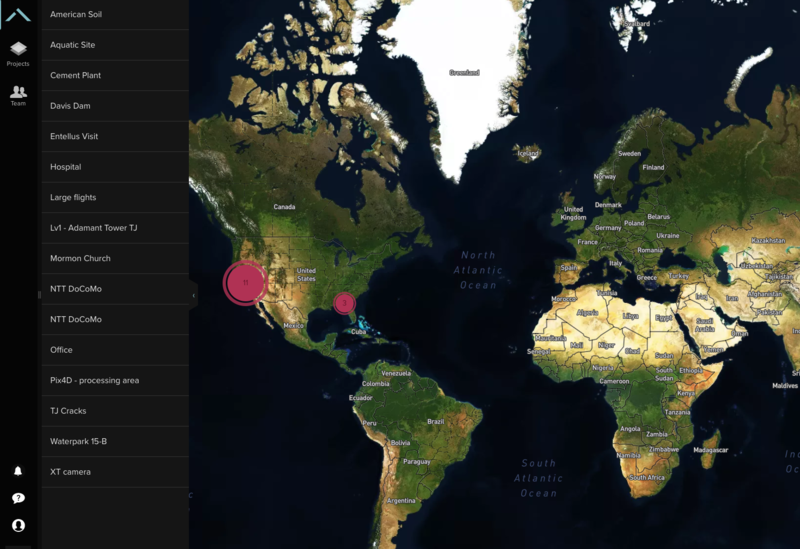 Click on the Flight name at the top left to display a drop down menu showing all the different Flights available within that Project. You can also use the arrows pointing left and right to scroll between them, they’re ordered by date. Once you select the Flight that you want, click on the “Process” button on the bottom left corner. At this point he processing phase will start. You can tell that the flight is processing by the icon that appears next to the “orthomosaic” section under Layers. You'll also receive a pop up notification with an estimated processing time on the bottom right corner. 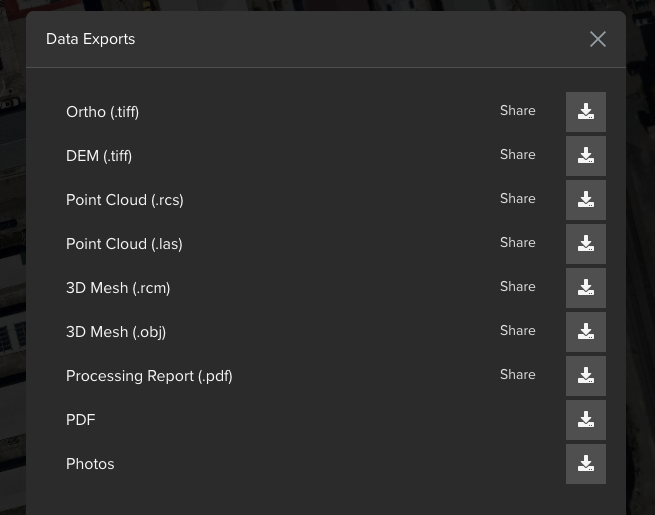 After processing is complete, click the Export icon on the bottom left corner of the screen which will open a window with all the resulting files. Clicking on any one of them will initiate the download of said file.